After three months of protests that sparked a national discussion about race and police violence, a grand jury decided that Ferguson, Missouri, police officer Darren Wilson will not face charges for fatally shooting 18-year-old Michael Brown on August 9. For weeks, both sides have been making preparations intended to prevent the situation from becoming violent, so it’s unclear why prosecutors chose to announce the decision at 8 p.m. local time (9 p.m. ET), knowing that crowds would become more unruly after dark. Here’s how the night unfolded. And with that we’re signing off for the night. 1:16 p.m.: Back in Ferguson, several stores are burning, and CNN reporter Sara Sidner was hit on the head with a rock on live TV. She said she was okay and tried to keep reporting, but the network told her to stop and move to a safer location. 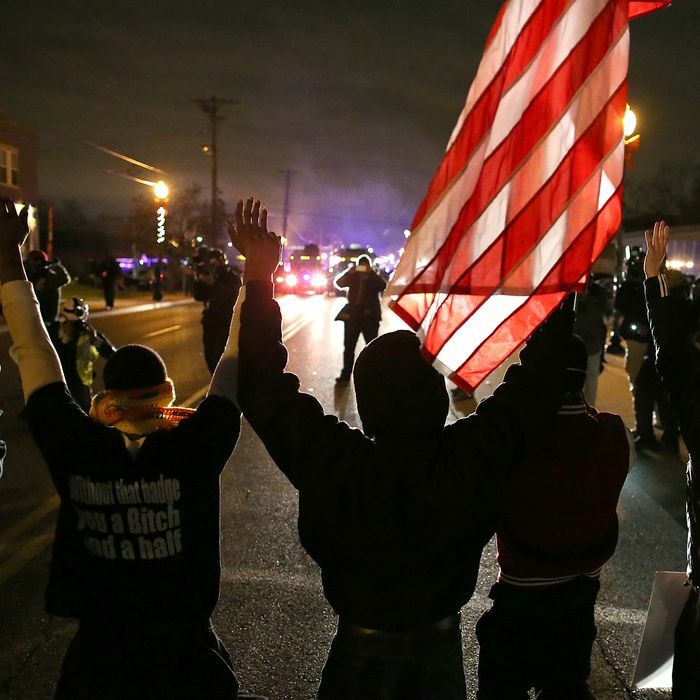 12:42 a.m.: Here are more updates on the protests happening outside of Ferguson. 12:14 a.m.: New York’s Jada Yuan is at the New York protest. 12:00 a.m.: The St. Louis airport is reportedly shutting down because of the protests. 11:54 p.m.: The St. Louis county prosecutor has released the full transcript of the grand jury proceedings in this 4,799-page PDF. 11:38 p.m.: Earlier in the night police insisted they were only using smoke on protesters, though TV anchors said on air that they were being tear-gassed. Now police admit they did use tear gas, but only after demonstrators failed to respond to the smoke. 11:27 p.m.: There were conflicting reports about the extent of Darren Wilson’s injuries, and now the St. Louis County Prosecutor’s Office has released photographs of the officer taken after the shooting. The images were presented to the grand jury as evidence. 11:07 p.m.: The Walgreens on North Florissant in Ferguson is burning. Two police cruisers are also on fire. 10:56 p.m.: A massive protest is under way in New York. There are also peaceful demonstrations taking place in Seattle, Chicago, Oakland, and Philadelphia. 10:45 p.m.: Smoke, pepper spray, and bean bags were used to disperse crowds near the Ferguson Police Department after some protesters broke the windows of a police car and threw objects at officers. There were also reports of gunshots and looting in Ferguson. Officers are being hit with rocks and bottles on South Florissant Road. #Ferguson. 10:18 p.m.: CNN and MSNBC are showing the president’s remarks on one half of the screen, and Ferguson cops are using tear gas and riot gear on the other half. 10:04 p.m.: McCulloch refused to give any details on the jurors or how they voted. He would only say that nine were white and three were black. After hearing more than 70 hours of testimony from about 60 witnesses, they did not find probable cause for five possible charges, ranging from first-degree murder to involuntary manslaughter. McCulloch said the grand jury’s term was supposed to be over in September, and praised them for pouring their “hearts and souls” into the process. He also angered many people on Twitter by saying the jurors “gave up their lives” for the process. At Union Square, there were about 500 people. Now, a few minutes later, thousands of people marching south. "Hands up, don't shoot." 9:53. p.m: President Obama will speak about the decision at 10 p.m.
9:47 p.m.: I talked to Rev. Cleo Willis, a longtime leader in the nonviolent movement, at 6:24 p.m., as he was putting on a trench coat with a cross on it to participate as a “Peace Keepers captain” for Rev. Al Sharpton’s new Disciples Justice Action Network. The center of the action, he predicted, would be outside the courthouse in Clayton — though Willis reported that a man had spent 30 minutes “rapping” to the crowd by Mike Brown’s memorial about how if there wasn’t an indictment, tonight would be open season for shooting white people. 9:27 p.m.: It’s official: The grand jury decided not to indict Darren Wilson in the shooting of Michael Brown. 9:20 p.m.: McCulloch says the “the most significant challenge in this investigation has been the 24-hour news cycle” and rumors on social media. Because the world right now needs to hear McCollough unload his own bundle of resentments right now. Tone is totally wrong for the moment. it's Twiitter and CNN's fault. 9:18 p.m.: McCulloch said the jurors were selected in May, long before the shooting. 9:15 p.m.: St. Louis County prosecutor Robert McCulloch began the press conference by expressing sympathy for the Brown family and recapping the case. CBS, ABC go live to announcement. NBC, Fox stay with regularly-scheduled programming. The prosecutor’s press conference has yet to begin. The reason for the delay is unknown. 9:07 p.m.: St. Louis County Chief of Police Jon Belmar released a statement saying the “safety of our citizens” is his department’s primary concern. 9:03 p.m.: The press conference will be held in a 40-seat courtroom in the St. Louis Justice Center. There will be a 20-minute statement, then questions from the media. 8:52 p.m.: Since learning several hours ago that the decision would be announced tonight, hundreds of protesters have gathered in the streets of Ferguson. Many businesses in the city have been boarded up, and schools have been closed on Tuesday in anticipation of more demonstrations. Similar rallies will be taking place aross the country tonight. All updates are by Margaret Hartmann unless otherwise noted.